The near final versions of the AZOMITE production facilities, soil and feed promotional videos are here. Results from a veteran grower that astounded even us. 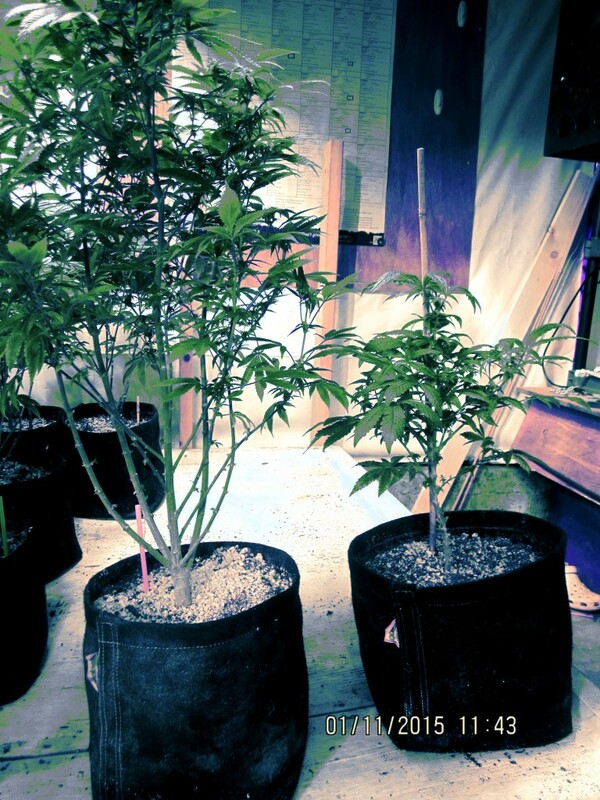 The grower added about 3 tablespoons of AZOMITE to the soil of plant on the left, in addition to the regular amendments. The plant on the right is the control – all the same amendments as the plant on the left, except no AZOMITE. 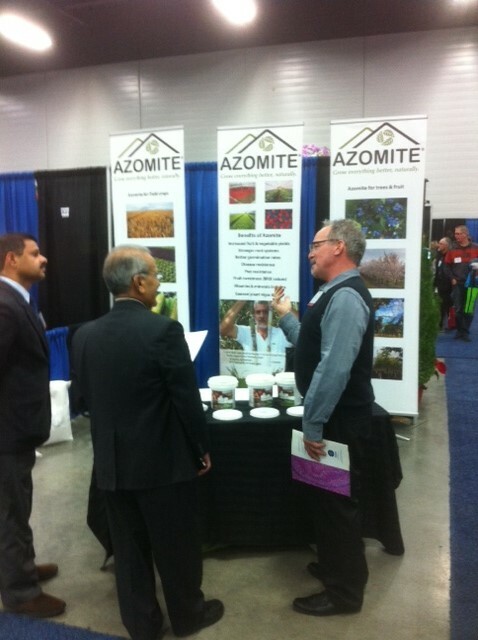 We are thrilled to announce that OMRI has reviewed Azomite Micronized (pma-5567) to the Canada Organic Regime regulations and has determined that it is Allowed for use in the Permitted Substances Category: COR: Mined minerals and unprocessed mined minerals, Class: Crop Fertilizers and Soil Amendments. This product will appear in the OMRI Canada Products List©, available on our website. Subscribing certifiers, state programs, and others will receive information regarding the OMRI status of this product in the next quarterly update. Please see http://massamllc.com/downloads-media/ for OMRI and other certificates, or view the certificate here. José Luis Staufert. Representante Química Lucava, S.A. de C.V., Veracruz, México. Área tratada/treated area: 2500 m². Fecha de tratamiento/Date of treatment: 5 de diciembre/December 5, 2013. Fecha de cosecha/Harvest date: 24 de abril/April 24, 2014. Observación/Observation: Azomite es una fuente de silicio al 65% + 65 minerales incluidos en el producto. Este producto se aplicó en macollamiento al voleo. AZOMITE® is a source of silicon (65%) and more than 65 minerals in this product. This product was applied by broadcast spreader. derecho). Nótese las espigas de arroz tratadas con Vitazyme + AZOMITE®(lado derecho, total: 53 espigas); espigas sin tratamiento (lado izquierdo, total: 41). El día del muestreo 4 de julio de 2014 el lugar estaba muy lluvioso. 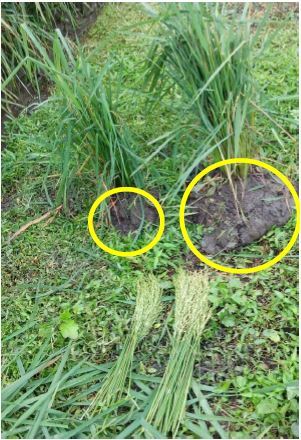 Note the larger root system on the plants treated with Vitazyme + AZOMITE® (right side, total 53 shoots); shoots without treatment (left side, total: 41). The date of sampling July 4, 2014, was very rainy. datos corresponden a 10 repeticiones por cada área muestreada (total de áreas muestreadas: 5). The vegetative potential developed by the plants, i.e. 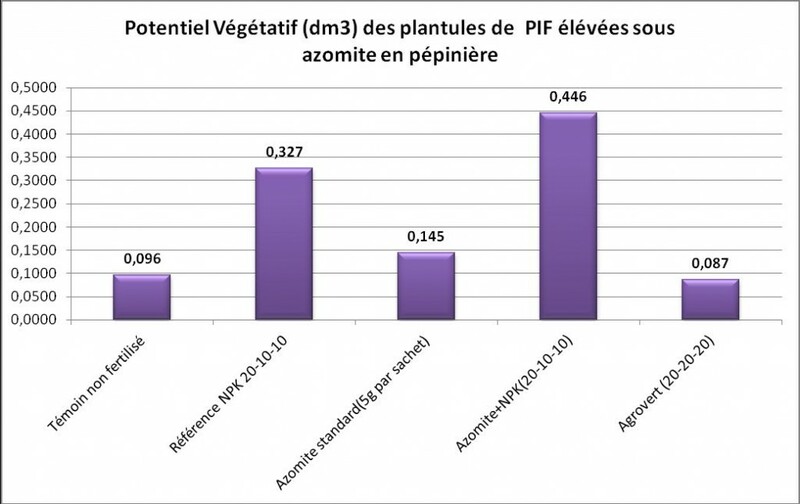 the volume of plant biomass developed above ground (see leaves and pseudo stem), is one particularly discriminating parameters of plants considered in this test with azomite (Fig. 5). Highly significant differences were observed (see photos attached) between the treatments. 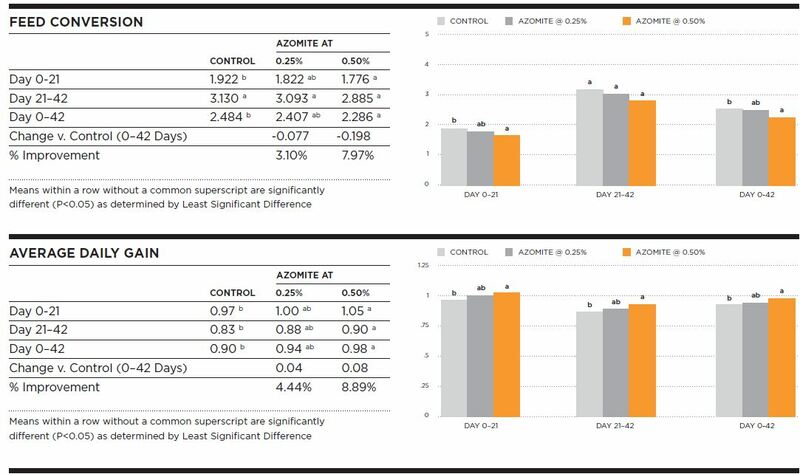 Azomite + NPK treatment developed the highest (365% increase over control) volume of biomass, followed by the reference NPK (241% increase compared to control), then the treatment having only azomite (51% increase over control). This is an interesting comparative advantage for plants receiving azomite as this will lead to a better performance of these plants after their transfer to the field and a possible early flowering. 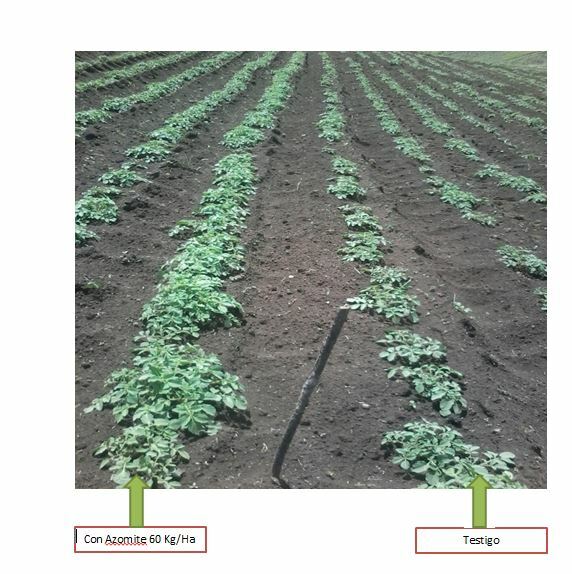 These assumptions will be verified during the implementation of the field component after this nursery trial. Figure 5: Variation of the amount of biomass produced by the plants as a function of treatment. The weight considered is that of the whole plant (pseudo-stem, leaves and roots). It showed significant differences between the treatments. 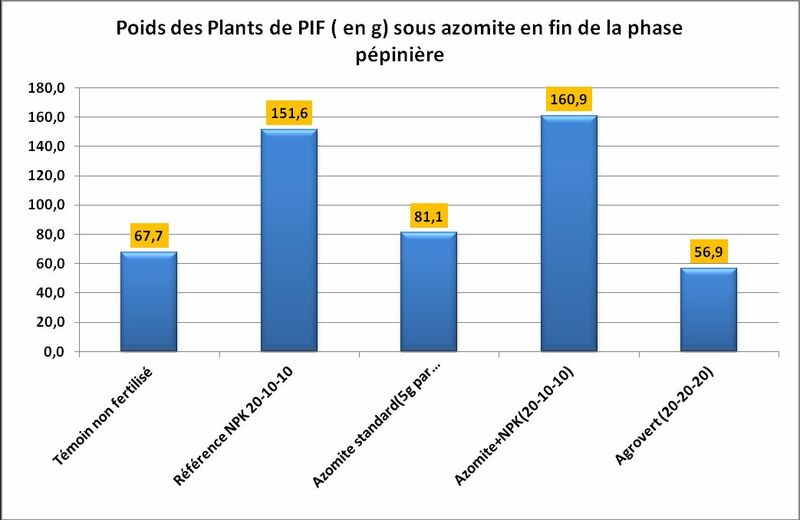 The weight of plants in T4 treatment (combination azomite + NPK) was higher than the NPK reference, the latter being followed by that of azomite only. These three treatments respectively represented weight gains of 138%, 124% and 20% compared to the control. -Root-emission, mainly when azomite is associated with NPK, with the possibility of increasing the number of roots by nearly 73%. 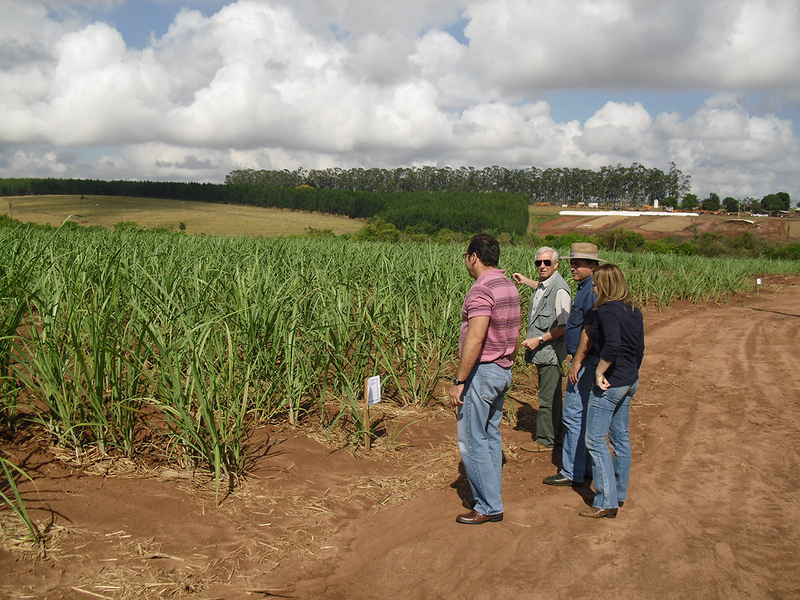 Besides the aspects mentioned above, it is interesting to note that azomite alone can contribute to an increase in biomass in the nursery from at least 50% to more than 7 times when combined with a mineral fertilizers. It is the same for plant weight which increased by 20% with azomite alone, and in case of a combination with mineral fertilizer (NPK), the growth proportion remains the same as for biomass (that is relatively 7 times). Because of these observations, we recommend the use of azomite in the nursery for plantain plantlets at a dose of 5g/sachet containing a plant in combination with a mineral fertilizer NPK, notably 20-10-10 used in this experiment. Azomite should be incorporated into the upper half of the substrate before transplanting the plantlets. Mineral fertilizer should be applied at a dose of 1g/plant from the 8th day after transplanting and then after every two weeks. Subsequent applications of azomite should follow the same sequence. If you would like a copy of the complete publication, please email Massam LLC. 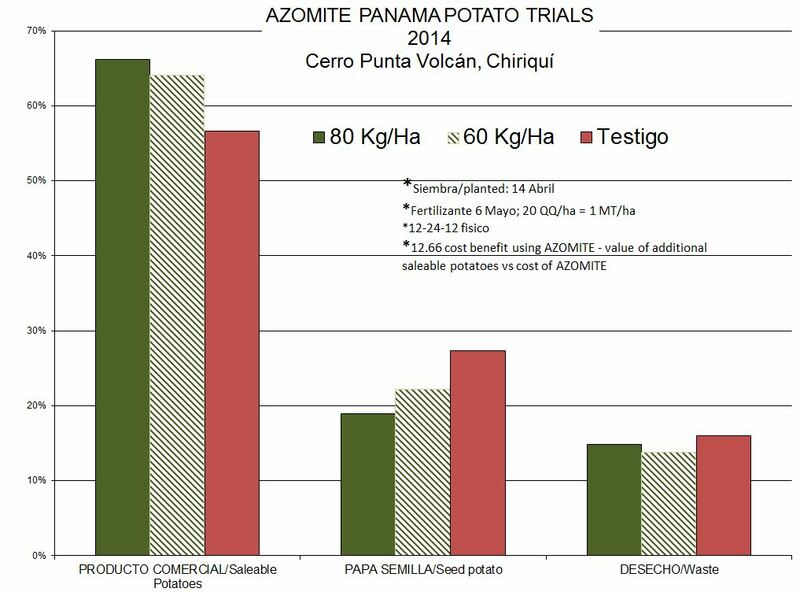 Using AZOMITE dose levels of 80 and 60 kg/ha (approximately 80 and 60 lbs per acre) compared to a control (testigo), the AZOMITE treated plots got a 12.66 cost benefit . The value of the additional yield was compared to the cost of the AZOMITE. The potatoes were planted the 14th of April. Below and here, please find a summary of the trial. From Canada — Greenstar Plant Products Inc. booth at the Sheridan Nurseries Preferred Partner Buying Show, Toronto, Ontario. Greenstar and Sheridan Nursery put together a very busy buying show and invited guests (plus the entire Sheridan Nursery Garden Centre Chain) that came from across Ontario, Quebec, Nova Scotia, Prince Edward Island, and Newfoundland! Sheridan has in excess of 140+ preferred partners that buy nursery stock from them and this entitled them to partake in the show and enter every $1000 purchased at a vendor for an entry ballot to win a new car. Greenstar put up a Hyundai Sedan and the buying was fast and furious from the opening until the close of the show! 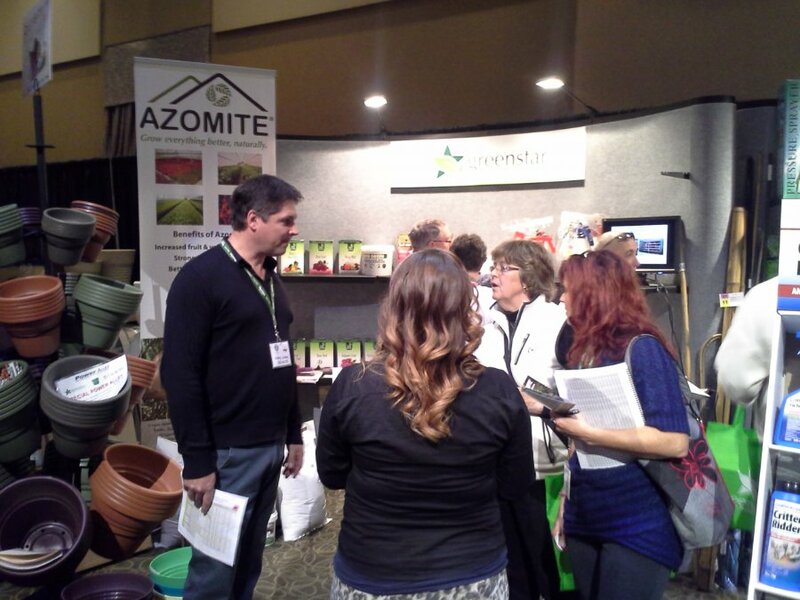 Many new vendors across Eastern Canada selling AZOMITE distributed by Greenstar and were very impressed with our new AZOMITE / Greenstar Contact team of Bill and Roy from Greenstar Plant Products, Cambridge, Ontario. Our product is in good hands with these gentlemen and we enjoyed meeting all their clients at the show! Thank you all for attending the show and dropping by the booth. Please visit us at the Green Industry Show in Edmonton, Alberta on the 13th and 14th November.